We’d love your help. Let us know what’s wrong with this preview of The Destiny of Sunshine Ranch by T.M. Gaouette. To ask other readers questions about The Destiny of Sunshine Ranch, please sign up. Touching story about a group of "reject" children whose foster family faces seemingly insurmountable challenges in staying together. The Destiny of Sunshine Ranch is an uplifting story for young readers that stresses the importance of family, healing, faith, and generosity. We meet Benny, a foster child who trusts no one and lacks faith in God. He’s been moved from place to place and arrives at Sunshine Ranch apprehensive and even unwilling to unpack his bags. Then, we’re introduced to the other foster children, all with diverse issues: depression, sadness, loss I can do all things through Christ which strengthens me. (Philippians 4:12-13). My favorite Bible verse, on the first page of The Destiny of Sunshine Ranch, lassoed me straight in to T.M Gaouette’s YA novel. The minute I started reading this story, I knew I was going to need a kleenex box nearby. I was right. I also knew I was going to love it. Right again. From page one I was pulled into this extremely moving novel about a young boy in the foster care system, unwanted and hurting, and how God draws him to Himself by incredible and quite surprising events. Benedict and sweet little Melanie stole my heart from the beginning, and the other characters were so well done that whether I loved them or coul The minute I started reading this story, I knew I was going to need a kleenex box nearby. I was right. I also knew I was going to love it. Right again. From page one I was pulled into this extremely moving novel about a young boy in the foster care system, unwanted and hurting, and how God draws him to Himself by incredible and quite surprising events. Benedict and sweet little Melanie stole my heart from the beginning, and the other characters were so well done that whether I loved them or couldn't stand them, they became real and unforgettable. The author's description is marvelous, and the whole story transported me, from the school principal's office in chapter one, to Miss Ratchet's dingy and abusive apartment, and of course to Sunshine Ranch, where delightful adventures awaited our young hero and his companions. Some of the twists and turns caught me totally by surprise. 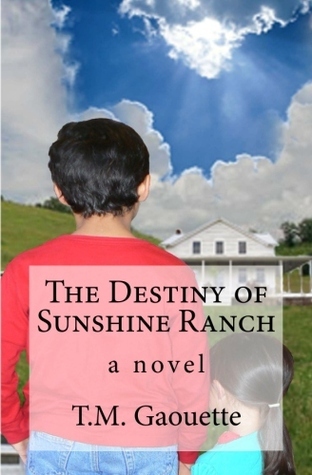 The Destiny of Sunshine Ranch by T.M. Gaouette is a lovely, heart-warming story. I’ve never read a book that focused on foster families and was extremely moved by this touching novel. The author creates an array of interesting characters that are flawed yet understandable and memorable. I think this book would be great for all kids to read, showcasing the power of love and family – no matter what that family might look like. This middle-grade novel is full of heart-breaking realities, faith-fille The Destiny of Sunshine Ranch by T.M. Gaouette is a lovely, heart-warming story. I’ve never read a book that focused on foster families and was extremely moved by this touching novel. This middle-grade novel is full of heart-breaking realities, faith-filled moments, and a powerful hopeful message. This book took me completely by surprise. From the amazing dialogue to the raw emotions it portrays and captures it is a wonderful read from the first to last word. I know a number of foster children. I have seen them come and seen them go. This book captures their lives, their experiences and their hopes. The book was incredibly moving. Having known so many kids who have gone through the foster system knowing some of their stories and some not so much this book captures children when they are v This book took me completely by surprise. From the amazing dialogue to the raw emotions it portrays and captures it is a wonderful read from the first to last word. I know a number of foster children. I have seen them come and seen them go. This book captures their lives, their experiences and their hopes. The book was incredibly moving. Having known so many kids who have gone through the foster system knowing some of their stories and some not so much this book captures children when they are vulnerable, when they are reactionary and when they fear hope. But hope and love is what many foster children need most. This novel peeks into the world of children in foster care, kids who have experienced things no child ever should. Sunshine Ranch is the home of a vulnerable child's dreams, with loving, faithful couple Martha and David caring for and educating 10 children who are in the foster-care system. Life at the ranch is not without its challenges, especially for 10-year-old Benedict who has had things particularly rough. This heartwarming tale has an unexpected ending. For more reviews, check out: What are people saying about, “The Destiny of Sunshine Ranch”? T.M. Gaouette is a wife, home-school mom, freelance writer, ghostwriter, blogger and fiction novelist. She was born in Africa, brought up in London, and is now living in New England, where she raises goats with her husband and four children. Devoted to Him, Gaouette is dedicated to glorifying God through her stories for children and young adults. She believes that life is too short to waste on the T.M. Gaouette is a wife, home-school mom, freelance writer, ghostwriter, blogger and fiction novelist. She was born in Africa, brought up in London, and is now living in New England, where she raises goats with her husband and four children. Devoted to Him, Gaouette is dedicated to glorifying God through her stories for children and young adults. She believes that life is too short to waste on the superficial and that adversity should be used to make one stronger. More importantly, Gaouette feels that the Lord has given us all special gifts and opportunities to make a positive difference. T.M. Gaouette is the author of "The Destiny of Sunshine Ranch" and the first and second book in her Faith & Kung Fu Series," Freeing Tanner Rose," and "Saving Faith."